Kingston is a small community on the northern end of the Kitsap Peninsula with just over 2,000 people. It is situated on Appletree Cove in the Puget Sound and is a part of Kitsap County, Washington. It is the location of the ferry to Edmonds and the Lynnwood-Shoreline area north of Seattle. 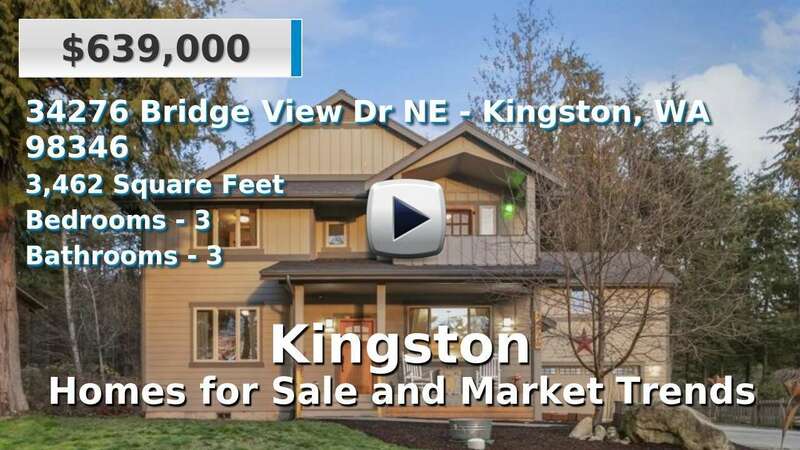 Kingston is a growing place with newer than average homes for sale and a small town feel. Residents and visitors alike take the 30-minute ferry to listen to concerts, attend festivals, and enjoy a variety of water sports. 3 Beds | 2.5 Baths | 2068 sq. Ft.
3 Beds | 2.5 Baths | 2251 sq. Ft.
3 Beds | 2.5 Baths | 2578 sq. Ft.
3 Beds | 3 Baths | 2414 sq. Ft.
4 Beds | 2.5 Baths | 2035 sq. Ft.
2 Beds | 2.75 Baths | 3626 sq. Ft.
3 Beds | 2.5 Baths | 2930 sq. Ft.
3 Beds | 1.75 Baths | 1794 sq. Ft.
3 Beds | 2.5 Baths | 2968 sq. Ft.
4 Beds | 4 Baths | 6643 sq. Ft.
3 Beds | 3 Baths | 3147 sq. Ft.